Two of "Buffalo Bill's" Company Complimented for Bravery. 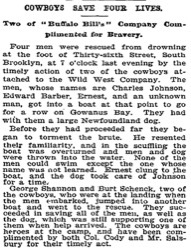 Four men were rescued from drowning at the foot of Thirty-sixth Street, South Brooklyn, at 7 o'clock last evening by the timely action of two of the cowboys attached to the Wild West Company. The men, whose names are Charles Johnson, Edward Barber, Ernest, and an unknown man, got into a boat at that point to go for a row on Gowanus Bay. They had with them a large Newfoundland dog. Before they proceeded far they began to torment the brute. He resented their familiarity, and in the scuffling the boat was overturned and men and dog were thrown into the water. None of the men could swim except the one whose name was not learned. Ernest clung to the boat, and the dog took care of Johnson for a time. George Shannon and Burt Schenck, two of the cowboys, who were at the landing when the men embarked, jumped into another boat and went to the rescue. 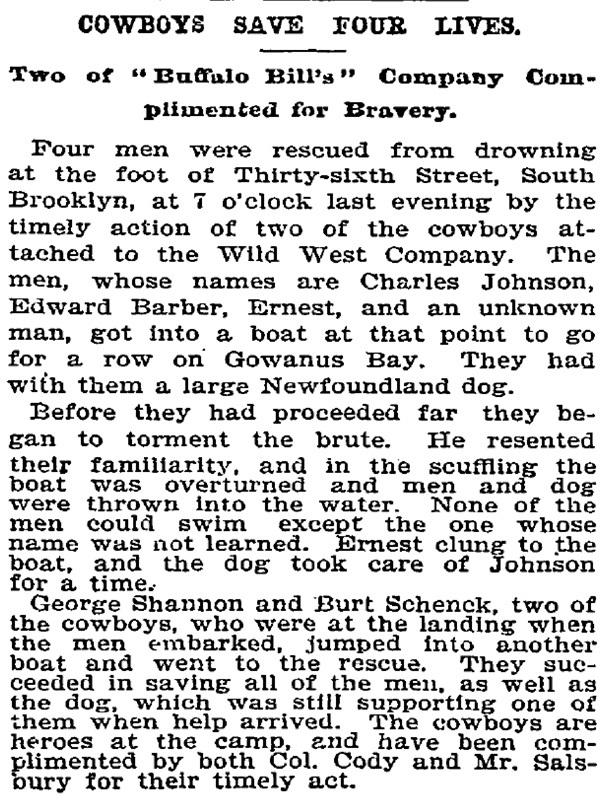 They succeeded in saving all of the men, as well as the dog, which was still supporting one of them when help arrived. The cowboys are heroes at the camp, and have been complimented by both Col. Cody and Mr. Salsbury for their timely act.